Post adoption of the Paris Agreement, developing countries in Africa seek innovative ways to leverage private and public sector finance to support implementation of their mitigation commitments. The Clean Development Mechanism (CDM) has primarily contributed to achievement of mitigation targets through implementation of projects and programmes, access to finance, and a robust Measurement Reporting and Verification (MRV) structure. The question remains how to best link the CDM to emerging mitigation actions such as Nationally Appropriate Mitigation Actions (NAMAs), Nationally Determined Contributions (NDCs) and low emission capacity building projects being prepared by countries as part of their Paris Obligations. 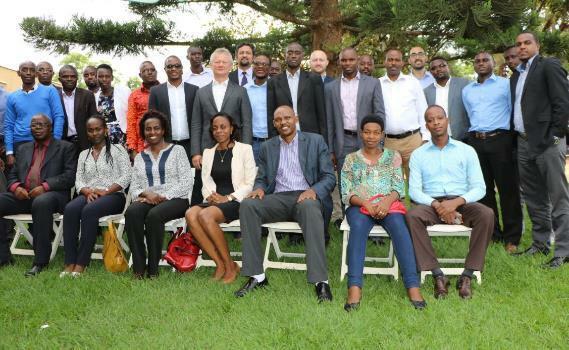 In April 2016, the UNFCCC Regional Collaboration Centre Kampala (RCC Kampala) together with the Rwanda Environment Management Authority (REMA), GIZ-Uganda and Carbon Africa conducted a two day training workshop in Rwanda for public and private sector. The workshop was designed to facilitate dialogue among various stakeholders in Rwanda on the opportunities presented by the CDM and how it can be linked to broader mitigation actions, means for capacity building and leverage finance for these actions. The workshop was attended by over 40 participants including representatives from various ministries, Government authorities, the private sector, project developers and project consultants. Mr. Faustin Munyazikwiye, Director of Climate Change Unit at REMA, in his opening remark highlighted that Rwanda’s green growth climate resilient strategy includies a national fund for projects and initiatives (FONERWA) enabling allocation of resources to various sectors. Rwanda is actively participating in the CDM with over 15 registered projects and programmes of activities and has successfully submitted its INDC, in addition to submitting 7 NAMA ideas in various sectors to the NAMA registry. Further, he explained the national institutional arrangements for the CDM and the requirements by the government for approval of CDM projects and PoAs. REMA, the Designated National Authority (DNA), for Rwanda is in charge of the development of the national strategy for the implementation of the carbon market in Rwanda in addition to issue a Letter of Approval (LoA) to CDM project participants upon the decision of the technical committee. RCC colleagues Ms. Ritah Rukundo and Mr. Vikrant Badve gave participants insight on the CDM as a global mitigation tool, highlighting the role of the RCC which is to provide on-the-ground support as an effort to increase the regional distribution of CDM projects by removing some of the barriers that projects developers and the governments may face in the development of CDM projects, PoAs and standardized baselines. Furthermore, Mr. Badve introduced the concept of Standardized Baselines (SB) with an overview of the procedure for development and further application within the CDM and wider mitigation actions. He emphasized the benefit of SBs as a reliable and transparent means to develop baseline or baseline factors for monitoring, reporting and verification purpose of mitigation outcomes. In addition SBs can be used for demonstration of additionality and simplifying the baseline development process for CDM projects in addition to wider mitigation outcomes including NAMAs, NDCs, and carbon finance. CDM project developers such as Atmosfair, Gigawatt Global and DG Works also gave their experience regarding the development of CDM projects/PoAs within the region, challenges faced and how they are working to scale up their activities in the region. Mr. John Semulema from GIZ shared the organization’s experience in development of the SB on Improved Institutional cookstoves for Uganda. He further explained the importance of an initial analysis of existing country policies, country needs, availability of data and financial implications prior to the development of a sector-specific SB. As part of the lessons learnt during this process, GIZ shared their experience with the need for intense stakeholder consultation, data quality control and the need for creating awareness of the SB to potential users especially for the private sector. Mr. Tim Cowman from Carbon Africa underlined the fact that CDM has primarily contributed to achievement of mitigation targets through implementation of projects and programmes, access to finance, and a robust MRV structure linking the CDM to wider mitigation actions. He stressed the need to consider knowledge and experience from the CDM, while scaling up the mitigation actions involving strategic identification of financing needs and mapping these against emerging climate finance streams. The role of the private sector to ensure the success on these actions in the country and region was a key factor highlighted during the workshop. To further build regional capacity, RCC Kampala looks to conduct similar workshops in countries within the region based on the country needs.